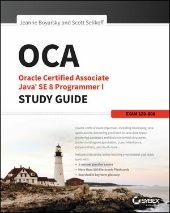 I'm currently reading or let's say studying the book "OCA: Oracle Certified Associate Java SE 8 Programmer I - Study Guide Exam 1Z0-808" (ISBN: ) of Jeanne Boyarsky and Scott Selikoff. I like the style of the book and the tricky exam questions at the end of every chapter. Nevertheless i tried exam 2 and compared my results with the ones in Appendix A. In the Appendix is written that option A is correct and, but at the end of the explanation is noted that answer B is correct. The problem is now, that if you just check the number of the example and the correct answers, which are normally written immediate after the number of the example is wrong. The explanation of example 18 should start with "18. B." and not with "18. A.". PS: What I don't like about the book is that some examples have code that starts at the end of a page and goes on on the top of the next page. That's really hard to read. Dominik Bauer wrote: Nevertheless i tried exam 2 and compared my results with the ones in Appendix A.
Dominik Bauer wrote: In the Appendix is written that option A is correct and, but at the end of the explanation is noted that answer B is correct. The problem is now, that if you just check the number of the example and the correct answers, which are normally written immediate after the number of the example is wrong. The explanation of example 18 should start with "18. B." and not with "18. A.". Dominik Bauer wrote: PS: What I don't like about the book is that some examples have code that starts at the end of a page and goes on on the top of the next page. That's really hard to read. Dominik Bauer wrote: I like the style of the book and the tricky exam questions at the end of every chapter. Thanks! The tricky questions prepare you well for the exam! Good catch. I've added it to the errata. Thanks for registering and letting us know! I think Roel is right about it being a paper saving measure. Or just "how books work." If it makes you feel any better, all the cert books I've read (from various major publishers) all have that problem. Good catch. I've added it to the errata. Sorry. Fixed that. I'm bad with names. I really should copy/paste them. The reason that I don't is then I'll never learn how to spell them or remember them.